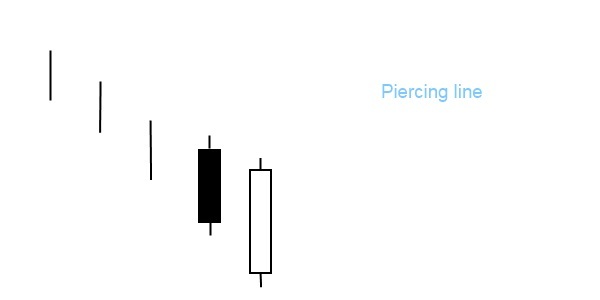 The piercing line is a bullish trend reversal pattern with two candlesticks. It forms in a downtrend. A long black candlestick appears on the first day that is followed by a long white candle. The second candle opens lower with a gap but closes more than halfway into the body of the first day. It’s important that the top of the white candle should be above the mid line of the black. What happens on the market when a piercing line appears? A downtrend has been in effect and the price is moving downward. Next day the price turns around dramatically, finishing near the high of the day. This is a warning sign for sellers since a reversal might soon occur. This bullish signal is easy to spot and confirm. The piercing line is the opposite of the dark cloud cover.